Mark Montano: FISKARS FRIDAY IS HERE!!!!!!!! 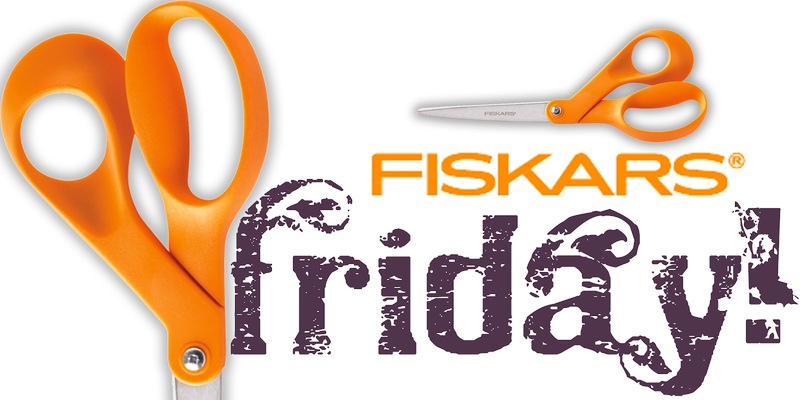 Today is our 6th official Fiskars Friday! Make sure to enter because as you already know, FISKARS has incredible cutting tools and they might just end up in YOUR craft room! This contest is bi-monthly so look for our FISKARS FRIDAY banner and make sure to enter following our simple rules below. Celia Webb's prize package from 2 weeks ago! Happy Fiskars Friday Mark! Happy to share the news on my FB wall. I think everyone needs to stop by and follow your blog for fun inspiration and wonderful art. My favorite Fiskars tools are my punches and love my gardening tools!!! I LOVE LOVE LOVE my Fiskars gardening shears. But I REALLY want a rotary cutter. Here is hoping I win one of these! Hands down Fiskars! If the house catches on fire, I'm grabbing them on the way out the door! Hands down Fiskars!! If the house catches on fire I'm grabbing them on the way out the door! Love fiskars scissors and punches!!!! thanks for a chance to win some awesome goodies!!!!! shared on facebook and im a follower as well!!! I already follow you,I'm Fiskateer 5095,so it's hard to choose,but,my most used product are my scissors,And Mark,I wish I could win a book from you,that would be the perfect birthday present!I shared and going to do the other,so count me in! done... done ...and done .... my fave would have to be the rotary tool then again i love it all ... ant wait to see whats in my box , Thanks Mark ...and Fiskars , shared and commented on !! crossing my fingers !!! I know I'm boring, but what I really need is scissors! My good crafting scissors have vanished into the ether. All of the above is complete. Hope it's me this Lovely Fiskars Friday!!!! My favorite tools are the LED Surecut paper trimmer and Squeeze punches....I could really use a circle one to make flowers with. 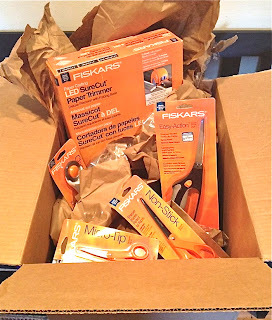 Thanks so much Mark for another great chance at winning....Love me some Fiskars. Did all of the above! My favorite Fiskars tool is their rotary cutting trimmer. I need a replacement cutting strip, and it'll be good to go again! Thanks for the chance to win!! I have done all above! I use fiskars sewing scissors and rotary cutter daily! All completed. Would love to have a new paper trimmer. Liked, Loved and in love. For me Fiskars rocks. I have about 40 pair of scissors and one pair is over 30 years old. ( I got them from my grandma) they are my favorite. Little itty bitty pair of scissors with an orange handle. Simply LOVE them. love the contest love the products dont have a fave there all great,but your ideas and tips are the best!! I would love a rotary cutter!! Hey Mark :O) I did everything that you asked. I would like the craft drill in green (or black if green is not available) if I win. Thanks for everything that you do. 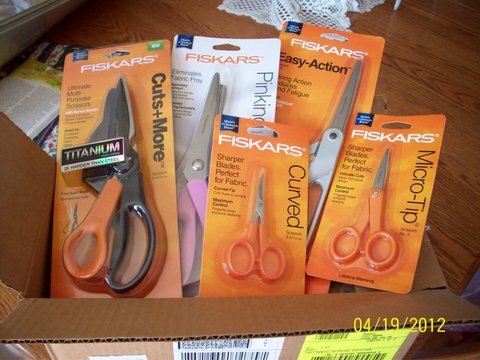 OH, I love so many Fiskars products! I have my eye on the hand drill and several border punches right now! I liked Fiskars and told them you sent me! I like my circle punch, but I would LOVE some scissors. Everything complete! :) Happy Fiskars Friday to you!!! My favorite tools are everything punches not forgetting their amazing scissors of course! All numbers completed! I have never had the pleasure of using a friskars tool and would the chance to. Scissors has to be my all time fav. Been using them for almost 40 years .. but gotta keep tracking them down when people borrow and don't put back LOL Would love a rotary cutter .. seems like everyone wants one! All done!! What wouldn't I love? I really need a new board for cutting. Thanks for doing these contests they are so fun, WOULD LOVE TO WIN THE BOOK!!! Love all their scissors...... would love a new pair of pinking shears....mine are about 20 yrs. old. Love all their products....but I really would like a new pair of pinking shears. Mine are about 20 yrs. old. My paper cutter is something I could not live without! 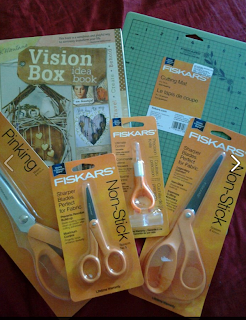 Yay love Fiskars!! I love their scissors and edgers. ANYTHING quilty - love anything rotary as well as anything spring loaded! We grew up in a Fiskars household where we knew if we even LOOKED at Mom's Fiskars with a piece of paper in our hands, we were in deep trouble...LOL! Yay I love Fiskar!! I love their scissors and edgers would love to try their trimmers though. It would be so much easier for my crafts! I have many Fiskars products in my house - I love the rotary cutting mat and rotary cutter especially (although I would love to try their Power Gear bypass pruners & loppers). I have done everything on the list - thanks for the chance to win! Already a fan of Fiskars on FB & wrote on their wall. Shared about the contest on my wall. I'm not sure of the name of them but they are small & I use them all the time when I'm crocheting. Congrats to last weeks winners! I love Fiskars products! I of course have had a pair of Orange handled scissors for years, but also have the shape cutter and a bunch of templates. Also have a few of the embossing plates. What I really would love is the Titanium snips and the cool ergonomic craft knife you slip your finger through. Think those would be great additions to the Studio. Any of their great products would be awesome to win though! ALL Fiskars products are great!!! I would have to say the product I like the most are the Easy Action # 8 Scissors. They are revolutionary. I love, love, love them and you and your FB page and your blog and your books!!! Happy Friday!!! 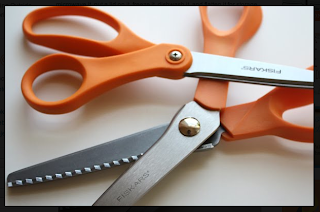 I love ALL Fiskars products and own a lot of their scissors. What I would really love to have is a pair of the EASY ACTION #8 scissors. I got to use them in a sewing class and I think they're fantastic. I also like the Microtip Fashion Scissors and the Donna Dewberry purple scissors. I love reading your blog and your books. Keep up the good work!!! Mark, I would LOVE any Fiskar product for sure but right now I need a GOOD pair of scissors to cut easily through chenille! woootwoooot! Thanks for the chance to win again! Happy Weekend everyone! Wow! I did it all! I liked the book on Amazon already, so I couldn't "like" it again! My new favorite: The Fuse!! Saw it today on fiskateers.com! Gotta have it! I would love a stamp press but sadly don't have one! Have used my sisters one and it's fab. I would love a stamp press but sadly don't have one in my craft arsenal! My comment disappeared! I would love a stamp press - would make things so much easier! My comment disappeared! Would love add a stamp press to my tool box! Well, I liked everything and after a lot of glitches liked the book on Amazon. I did the other facebook stuff too but the problem is my facebook is different than my google ID. But I did it all. I am a fan on Facebook of Fiskars, told them you sent me though. I shared on Facebook about the contest!! Did all the things and looked at all the stuff Fiskars makes! I would love some scissors and a new rotary cutter. All my stuff is getting old and the scissors I have now are pitiful.Your book is great! The Vision Boxes book is so creative. Everyone needs this book! I already Like Fiskars on Facebook. I popped over and left them a comment! I so need a new pair of Pinking Shears and a pair of scissors that will cut through fabric. (A pair that would be just for me, so my kids won't take them and bring them back to me dull) I need alot of things for crafting, but those two are on the top of my list! Thanks again!!!! I love my Fiskars self healing mat, it's been my go to work surface for the last 9 years but a couple of weeks ago I foolishly used my heat gun and forgot to move my mat, now my poor mat is all bubbled up. I can't bring myself to toss it away. I'd love the Fiskars 24" by 36" cutting mat or the 45mm Rotary Cutter with Loop Handle...I want to start quilting and I know I'm going to need a much better rotary cutter than the cheap one I have now and a large enough cutting mat for my clumsy hands. My favorite Fiskars tools are the squeeze punches! 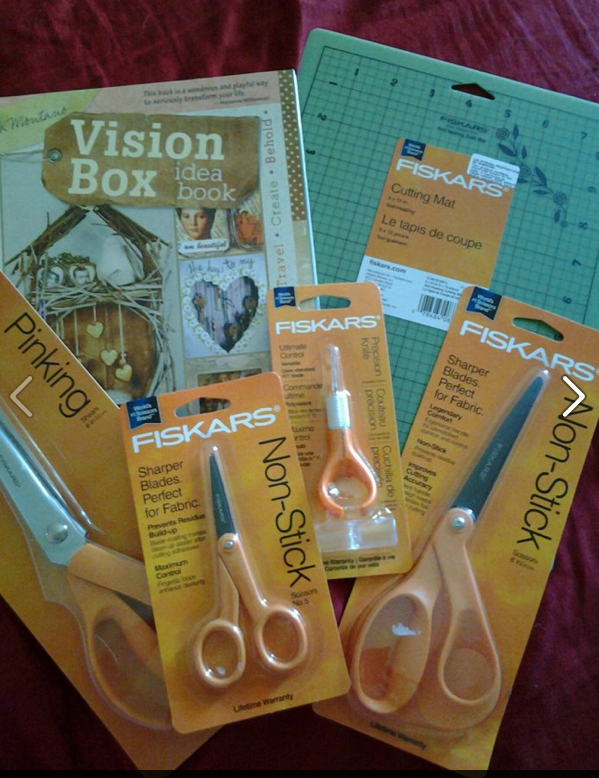 I LIKE and comment on the Fiskars FB page that I sent you! I like Fiskars on Facebook. Fiskars has many wonderful tools that I love in my sewing room, not to mention the majority of my gardening is done with Fiskars gardening tools. But my favorite is the new titanium rotary cutter. A must have for any serious quilter! I'm following your blog Mark and your new book looks great! 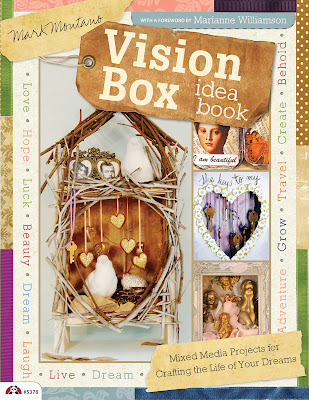 I liked LIKE VISION BOX IDEA BOOK on Amazon.com too! I love their Micro-tipped scissors!!! And much more! I am now following you. I ordered your book from Amazon. I shared on Facebook. I would be happy with anything Fiskars makes. I have several of their sissors, hole punches, mats,etc. I am a fan for sure. My favorite has to be the rag (craft) scissors from a few years ago I bought for rag quilts! It made my job so much easier and quicker! If Fiskars makes it, I can use it. Liked, shared, commented and I think I'd really like new pinking shears. Thank you. I "Like"d the Fiskars Facebook page. Fiskars Friday is a great day!!! I had already "liked" your Vision Box Idea Book on Amazon - congratulations, you are now up to 84, lots more since my last visit to Amazon!!! Hi I've followed all the rules! Just this week I bought a swivel knife. I love it but I think I'm going to need more practice. I think the punches are my favorite so far. I'd love to get some more if I win ;) I have the lace border, broken square and scalloped circle and they are great! thank you so much for this opportunity to win the best tools ever! I liked the book on Amazon, with my housband's account! I love all things Fiskars, especially my rotary cutter and sewing scissors (can't be without them) but I've been wanting an easy action, a snip to replace the one I lost, and a circle cutter. I'm following your blog , my favorite fiskars are the small spring loaded. I have two and use them all the time.